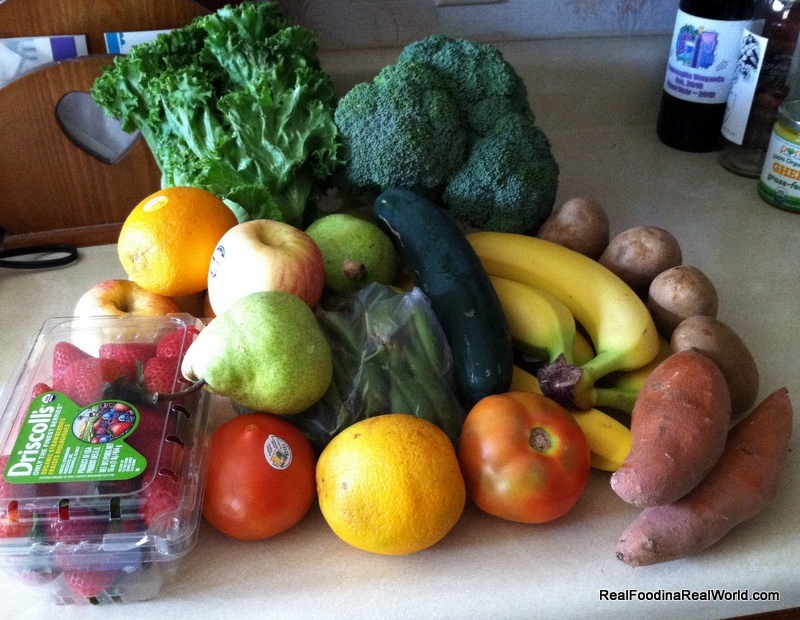 So here’s what we bought at Casa de Real Food this week. Went to Pure Pastures, bought a bunch of stuff and didn’t take a picture! We bought Calder Dairy black cherry ice cream for the hubby, beef pasties, eggs, like 4 pounds of boneless chicken breast, and three pounds of grass-fed ground beef. We spent $56, but $30 of that was covered by the Living Social coupon we bought a month or so ago. Door to Door Organics this week was fairly normal.Except for the fact that I accidentally purchased too much hummus. If there is such a thing as too much hummus. 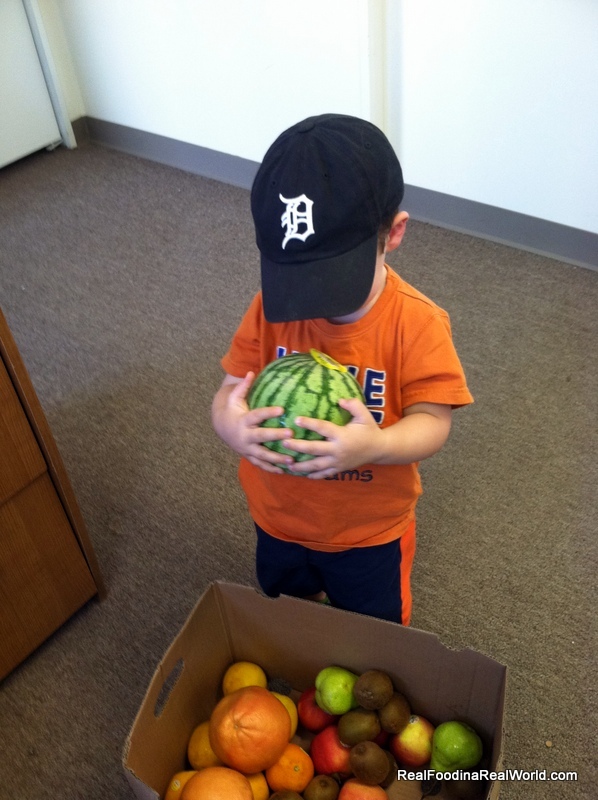 Local toddler looked through every single item in the freebie bin at Door to Door Organics. After great consideration, he selected a watermelon. My belly is so happy to have strawberries on a regular basis right now. Some sugar snap peas are buried in that pile too. I love spring and summer! Calder Dairy milk for local toddler, and eggs because I seriously can’t get enough eggs. I’ve been eating them scrambled with some Garden Fresh salsa and some avocado. Seriously amazing. 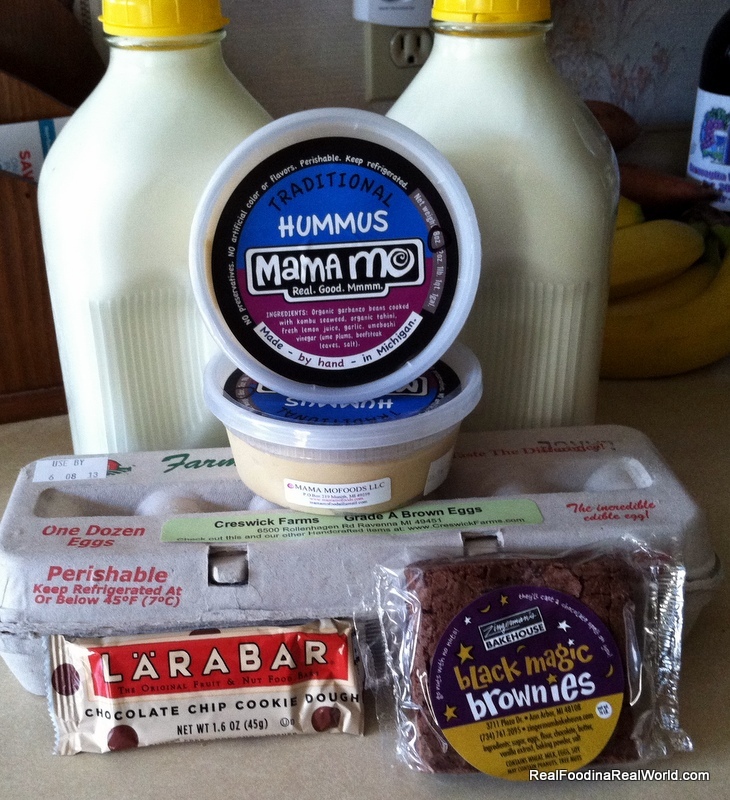 Some Mama Mo hummus and a Zingermans brownie for local hubby. I’m trying the Larabar for the first time. My friend Jennifer from Wine to Weightlifting is obsessed with Larabars, and this one was on sale so I’m giving it a try. Food costs from Door to Door was $58 this week, so added to Pure Pastures we spent $114 for the week. What did you buy this week? Try anything new? Discover anything local? 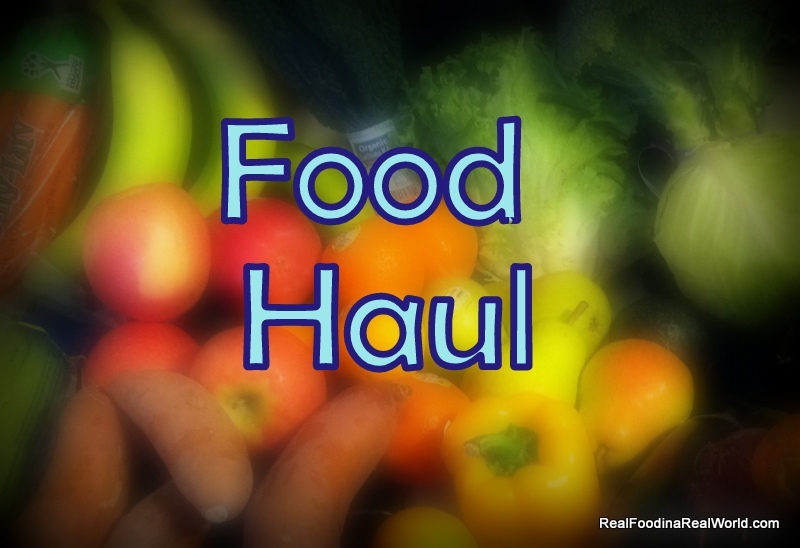 Farmers Market season is quickly approaching, once the Michigan grow season ramps up, we will lower our Door to Door Organics box down to a bitty size (we are currently getting a medium) and be shopping Farmers markets! I do a lot of canning and preserving, so it should be interesting to watch our food hauls and costs over the summer. new food purchase this week: Skinny Popcorn. I needed a vegan snack that prevented me from eating from the popcorn machine at work (lots of oil, butter and salt) The ingredients are All natural popcorn, sunflower oil, salt. it’s low sodium 25mg and low calories and fat. Here’s the kicker it can be a little pricey buying it premade from the bag, so eventually I will air pop mine but for convenience it’s very tasty and fit my diet :). I love reading your posts.. and seriously need to sit down one day and get organized enough with my meal planning/prepping to make the whole local process make sense. Sure I prep/pack weekly breakfast and lunch, but it’s ALWAYS the same – eggs, sweet potatoes, chicken, carrots, avocado. When I was single I ate pretty much the same stuff all the time. When I was working full time it just made things a lot easier. I got the cookie dough larabar. I took a few bites earlier today, it was good! Meal planning is so important but I still hate it.